A luxury, small group experience including return Singapore Airlines flights, an overnight cruise aboard a traditional houseboat in Kerala, internal flights, all accommodation including 5-star heritage palace style hotels, sightseeing and more. 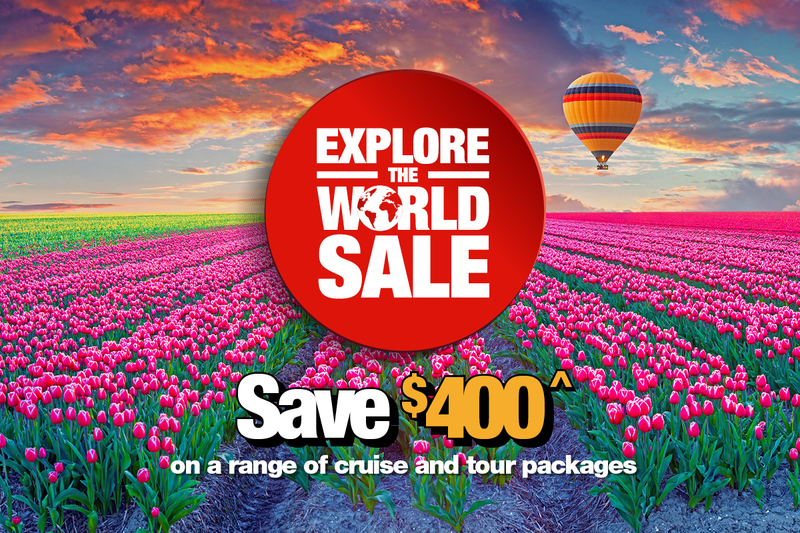 Explore the World Sale on NOW! 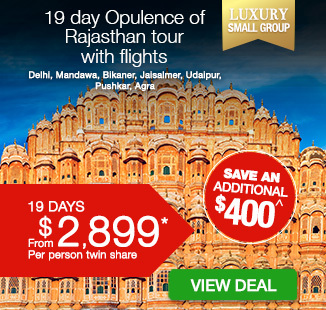 Book before 24 April to save $400^ per couple on this India experience. 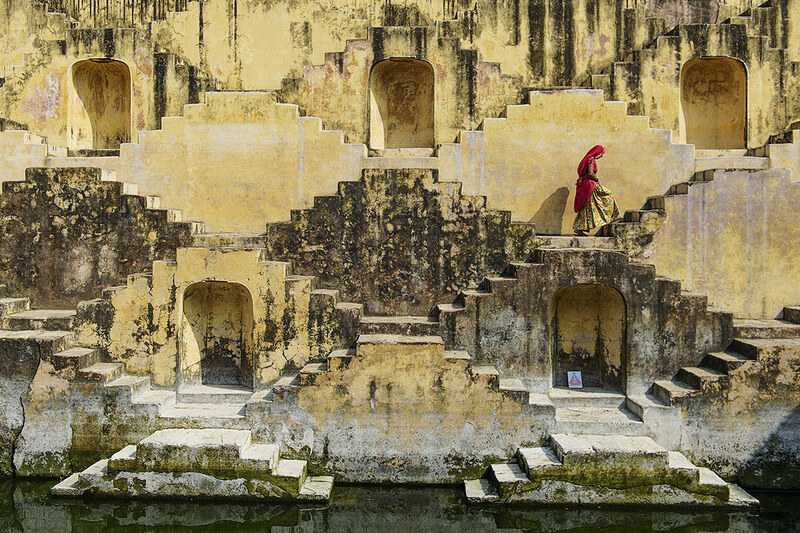 India is a destination that is as captivating as it is culturally rich and diverse. A 24 day India Grandeur is the perfect way to discover it all. Touch down in Delhi and get ready to thrill your senses. Delhi is as fast-paced, chaotic and overwhelming as capital cities come – and that is exactly where its magnetism lies. Explore Old Delhi, wander the grounds of the Red Fort, and hold on tight as you whizz through narrow laneways in a cycle rickshaw. Make the jump into New Delhi and move between its monuments including India Gate and Qutub Minar. 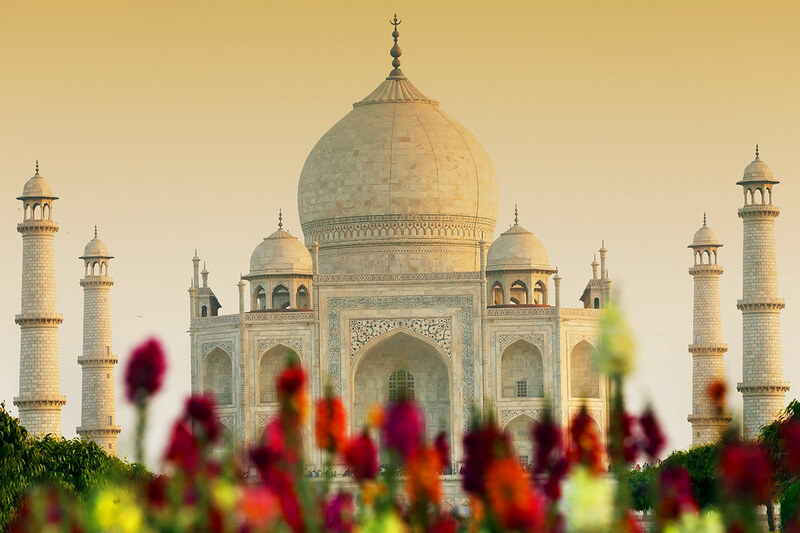 Be captivated as you catch sight of the impressive Taj Mahal. This monument to love is a manmade marble wonder and is worth the early wakeup call. Revel in the magnificent architecture of Rajasthan as you explore the coterie of fortresses and palaces in Jodhpur and Jaipur. Watch the sunset over the holy lake in Pushkar and take to the water with a cruise on Lake Pichola in Udaipur. Explore local markets in Mumbai and take a city tour in Chennai. 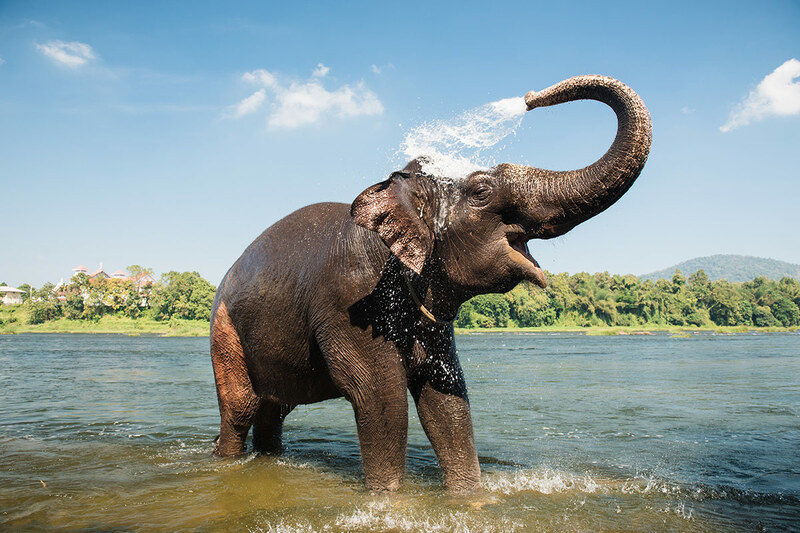 Stop off at an ashram to connect with your inner peace, and point out roaming elephants in a wildlife sanctuary. 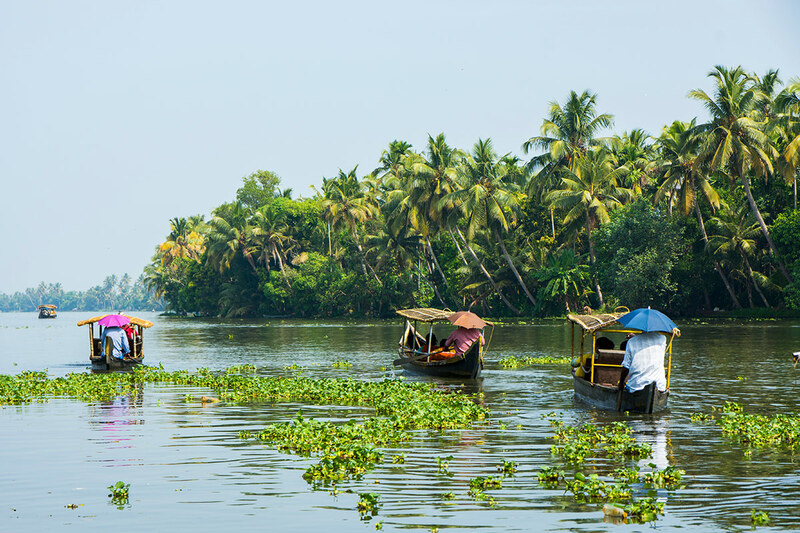 Float along the network of canals and lagoons that make up Kerala’s backwaters and spent the night cruising on a traditional Indian houseboat. 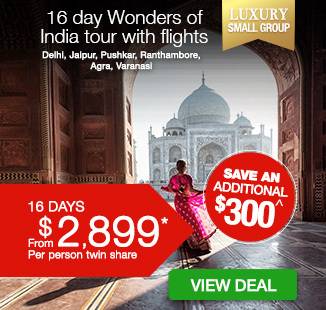 Depart Australia today on a flight to India. On arrival in Delhi, you will be met and transferred to the hotel. 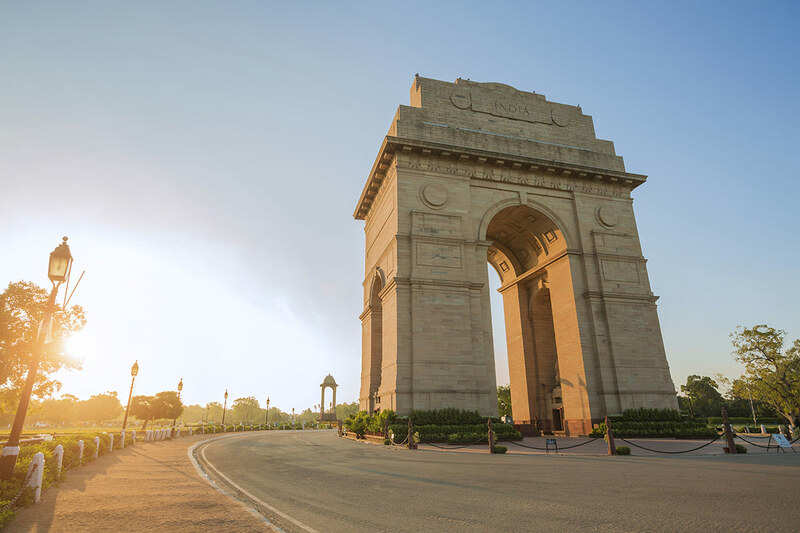 Embrace the eye-opening sounds, sights and smells of Delhi with a full-day sightseeing tour, leaving after breakfast. The tour begins in Old Delhi at the Red Fort and then Jama Masjid, before you experience the thrill of a rickshaw ride through winding narrow lanes. Jump from Old Delhi to New Delhi and visit India Gate, Parliament house, a Sikh temple and Qutub Minar. Leave Delhi behind as you undertake the five-hour drive to Agra. Here, you will visit Agra Fort – one of the city’s most frequented landmarks. 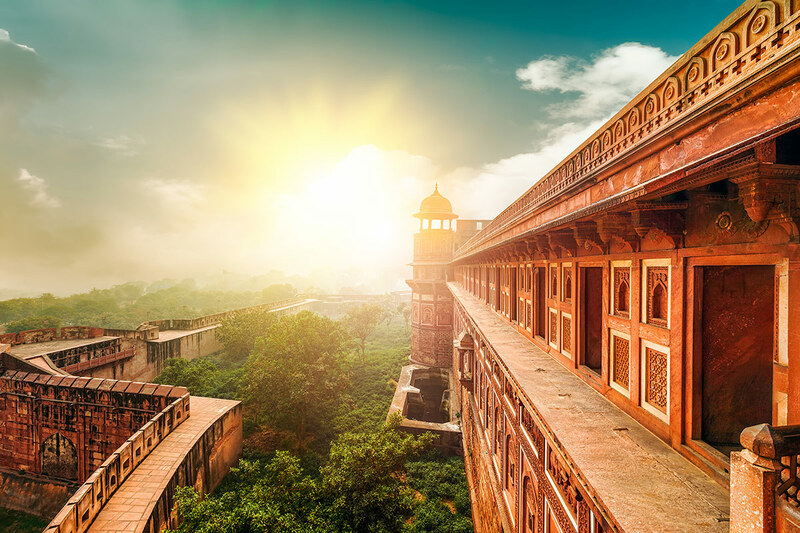 This ancient fortress is a symbol of Mughal architecture and was where Shah Jahan – the man behind the construction of the Taj Mahal – was imprisoned by his son. The Taj Mahal is an icon of India and is your first stop of the day. Rise early to see sunrise over this incredible site and be prepared to be blown away by this marble-clad monument. The World Heritage-listed Taj Mahal is a mausoleum, commissioned by Mughal emperor Shah Jahan in memory of his favourite wife, Mumtaz Mahal. The group travels to Jaipur from Agra, stopping off to see the stepwells in Chand Baori along the way. The journey takes approximately 5 hours and there is free time upon arriving in Jaipur. 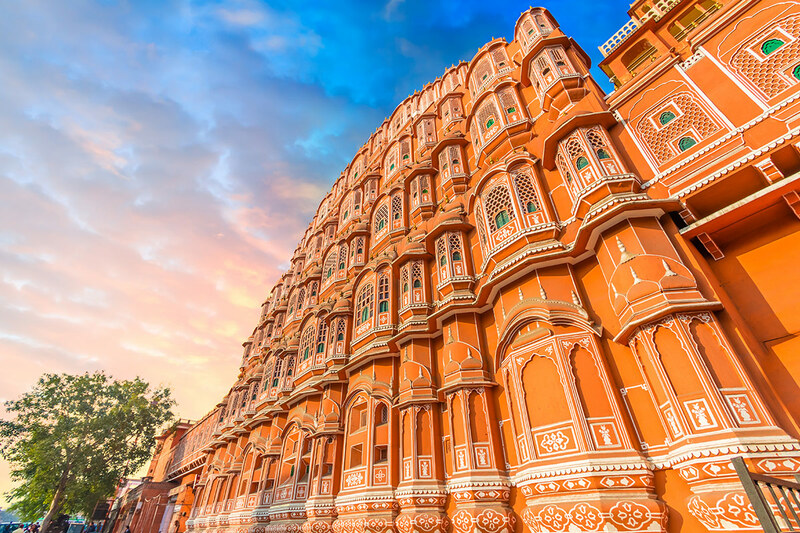 Travel to the iconic Hawa Mahal, an extraordinary pink-hued monument that is also known as ‘Palace of the Winds’. 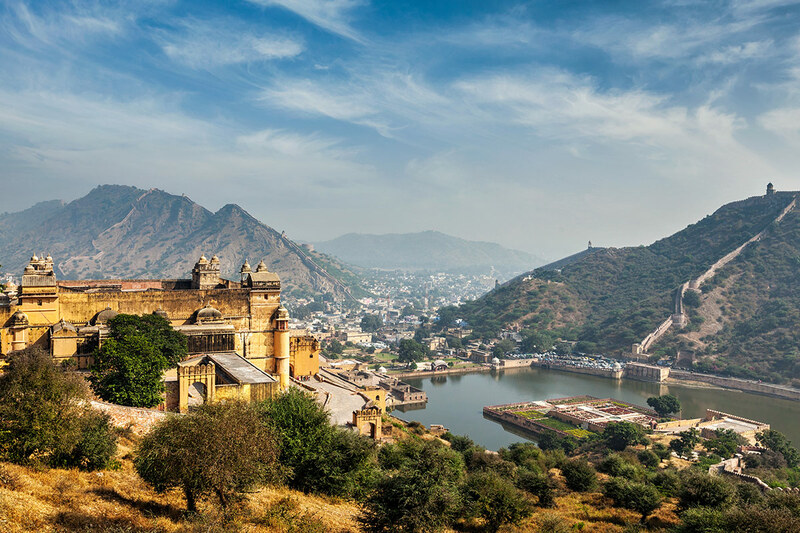 Then venture to Amer Fort, a magnificent fortress perched high on a hill and overlooking Maota Lake. Continue to City Palace and Observatory and have free time to explore the bustling local markets. Drive to Pushkar after breakfast. 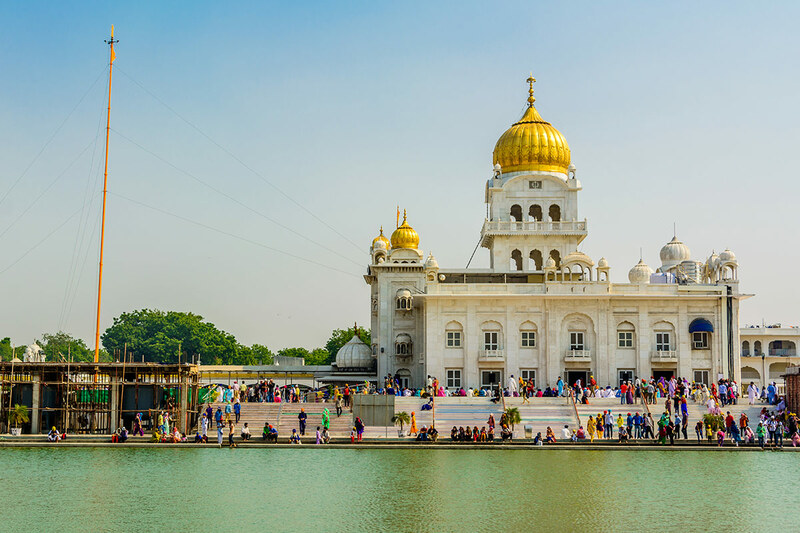 This mystical city is home to a Brahma temple – the only Hindu temple in India dedicated to Lord Brahma’s worship. Pushkar also has a holy lake, considered to be one of the most sacred in India and is surrounded by 52 palaces, 400 temples and 52 bathing Ghats (a series of steps that lead into the water). Pilgrims travel to the lake every year in November for a cleansing bathe. There is a morning drive to Jodhpur, which takes about 4 hours. Explore the local spice and vegetable market later in the day. Admire Mehrangarh Fort this morning. The majestic fort sits like the crown jewel atop a rocky hill and offers incredible views of the city. Today also includes a visit to cenotaph Jaswant Thada and the museum inside Umaid Bhawan Palace. Journey to Udaipur today. 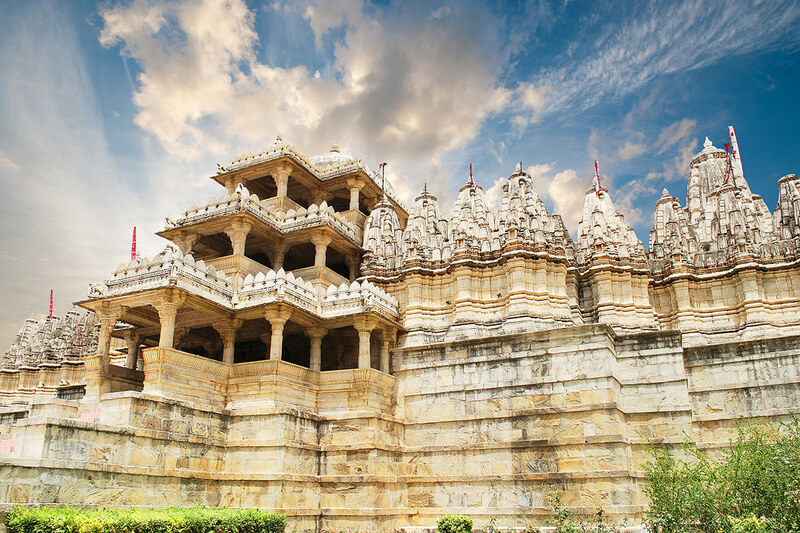 There is a pitstop to discover the Jain temples of Ranakpur en route. The group arrives in Udaipur, dubbed the ‘City of Lakes’, in the afternoon. Start your time in Udaipur with a tour of the City Palace. Keep a lookout for the Jagdish Temple, located just outside the royal palace. The temple is dedicated to Vishnu. 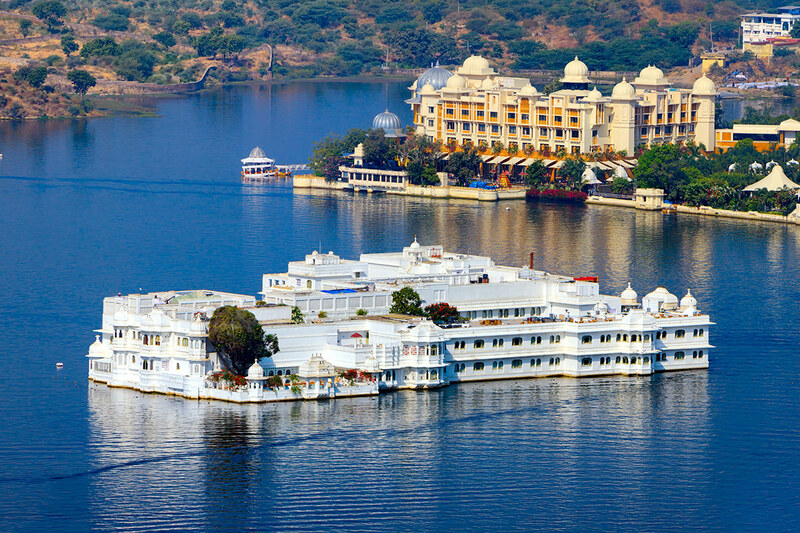 Drive around Fateh Sagar Lake in the afternoon and then cap the day off with a spectacular boat cruise on Lake Pichola. A transfer takes you to the airport for a flight to Mumbai, where you will be met and taken to the hotel. Relax at the hotel for the remainder of the day. 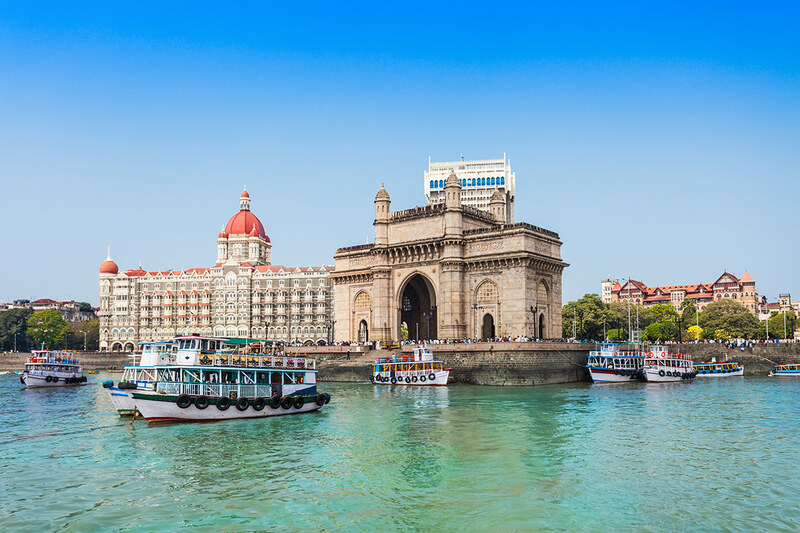 Become acquainted with Mumbai courtesy of a sightseeing tour, featuring trips to the Hanging Gardens of Malabar Hill, the Dhobi Ghats, the Mani Bhawan and Victoria Terminus. You will also have some leisure time to wander between stalls at the local markets. A transfer takes you to the airport, ready to board a flight to Chennai. You will be welcomed by a hotel transfer. A Chennai city tour introduces you to this incredible city. 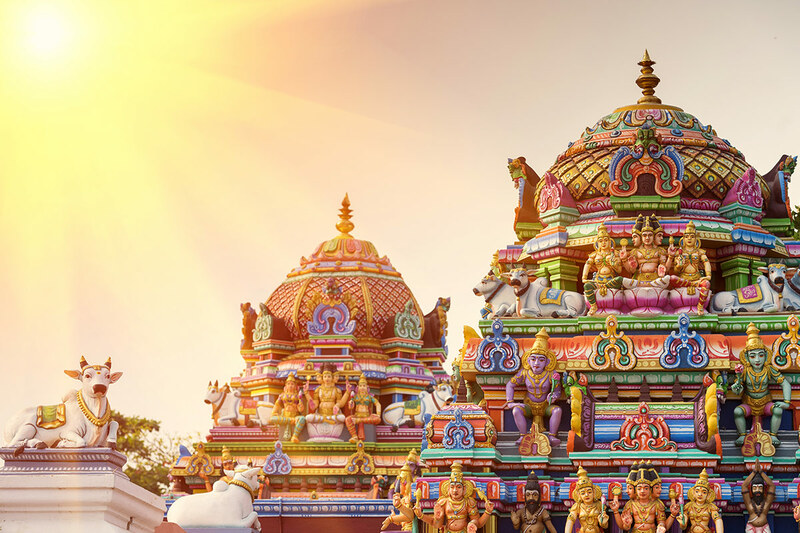 Catch a glimpse of the 16th century Kapaleeshwarar temple dedicated to Lord Shiva, and drive past Fort St. George, Marina Beach and St. Thomas Cathedral Basilica. Later, head to Dakshina Chitra, an arts centre that celebrates the folk performing arts, craft and architecture of India. Settle in for the 3-hour drive from Chennai to Puducherry (also known as Pondicherry). There is a city tour followed by a visit to an ashram, Auroville. The day winds down with a walk around the French quarters of Puducherry. 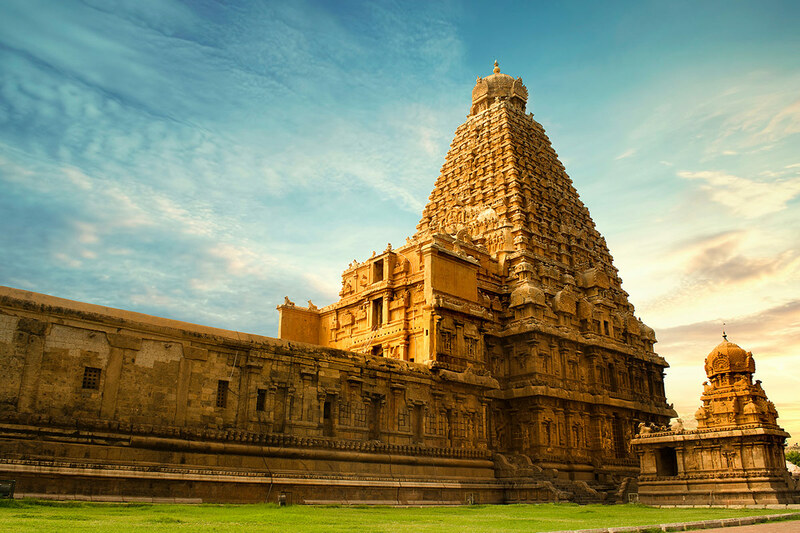 Travel to Tiruchirappalli with a 4-hour road journey. The tour visits the Brideshwara temple in Tranjore along the way. Arrive in Tiruchirappalli, check in to the hotel and spend the afternoon relaxing. Please note – as there are very limited hotel options in Trichy, your one night stay will be in a good quality well rated standard hotel. Today’s sightseeing experience begins at the Tiruchirappalli Rock Fort. Tick off the multi-tiered Sri Ranganathaswamy Temple in Srirangam; the largest Hindu temple in India. Travel to Madurai in the afternoon. Stop at the Thirumalai Nayakkar Mahal, an incredible 17th century palace, and the Gandhi Memorial Museum, which itself is houses within a 300-year-old palace. Wander through the bazaar to pick up some souvenirs before heading into the neighbouring Meenakshi Temple complex. Enjoy breakfast and then travel to Periyar – a journey of about 3 hours. 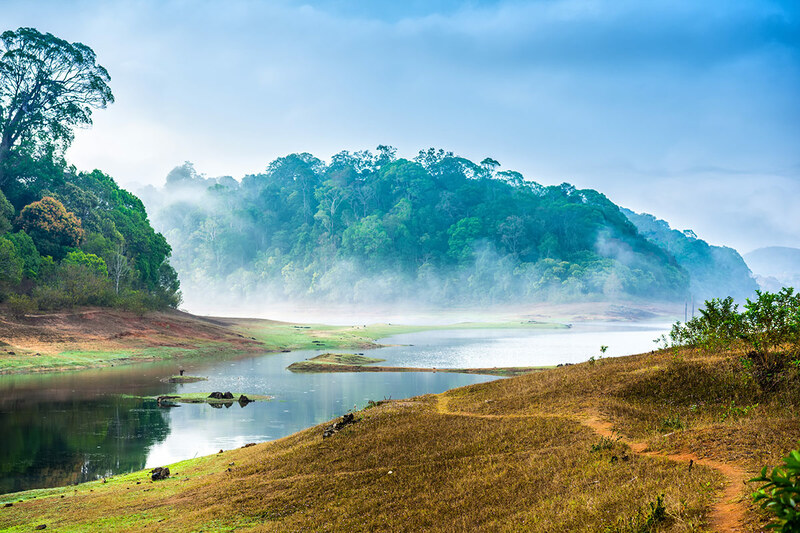 In the afternoon, enjoy a boat ride on the lake at Periyar Wildlife Sanctuary and keep your eyes peeled for the sanctuary’s residents: elephants, sambar and wild boar. Travel to Alleppey after breakfast. Board the waiting Kettuvallam, a traditional Indian house boat, for an overnight cruise on the palm-fringed Kerala backwaters. Tuck into local cuisine, prepared by an on-board chef, as you float along the tranquil waters. Rise early to take in the stunning view of sunrise offered by your houseboat vantage perch. Disembark after breakfast and drive to Cochin. A Kathakali dance show is on the itinerary for this evening. 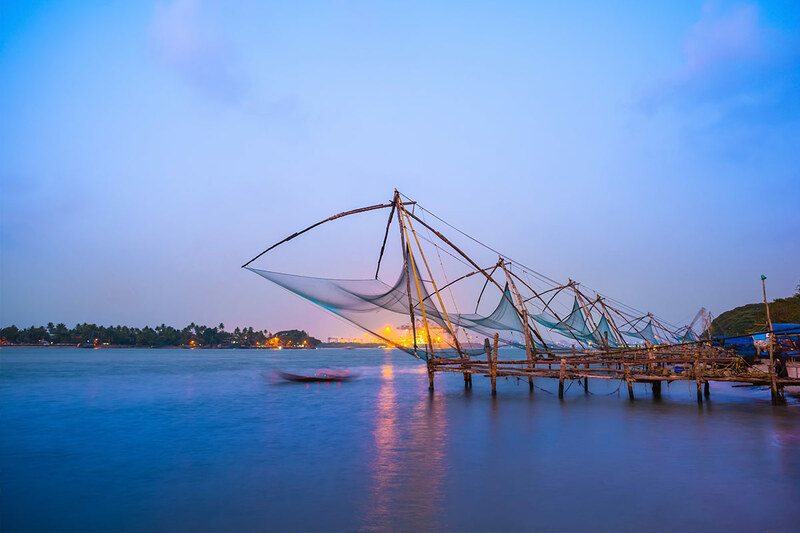 A sightseeing tour of Cochin, also known as Kochi, takes travellers past the Dutch Palace, the Jewish Synagogue, St. Francis Church and the Santa Cruz Basilica. You will also be able to see the unique Chinese fishing nets, a still-used method introduced by Chinese traders in the 14th century. Admire the Dutch and Portuguese buildings in the area. The tour comes to an end after breakfast. Then, you will be transferred to the airport in time for the flight back home. Today you will be transferred to the airport for your short flight to Varanasi. Tonight visit the downtown area in a rickshaw. Experience Varanasi intimately as you go on a leisurely rickshaw ride through the narrow streets and alleys of Varanasi. In the evening the Ghats and temples are lit with oil-lamp lights or candles. Participate in an Aarti Ceremony (collective prayer) and watch the floating Diyas (lamps) on the river Ganges. Enjoy an early morning boat ride on the holy river Ganges. The western banks of Ganges has a string of Ghats – the chain of stone steps, all built with pavilions, palaces and terraces, most of which are mainly used as Dharamsala where the pilgrims stay during their visit to the holy city. At dawn, the Ghats are abuzz with activity of the devotees performing their ablutions in the river or offering prayers to the rising sun and performing other religious rituals. A boat ride along the Ghats offers the best view of these activities while the sunrise on the Ganges is a soul-lifting experience. Late afternoon, drive to visit the Buddhist sites at Sarnath. It is the fabled place where Lord Buddha delivered his first sermon to his disciples expounding the principles of Buddhism. The ruins here date back to as far as the 3rd Century BC. Today you will be transferred to the airport for your short flight back to Delhi. Upon arrival check in at hotel and relax.